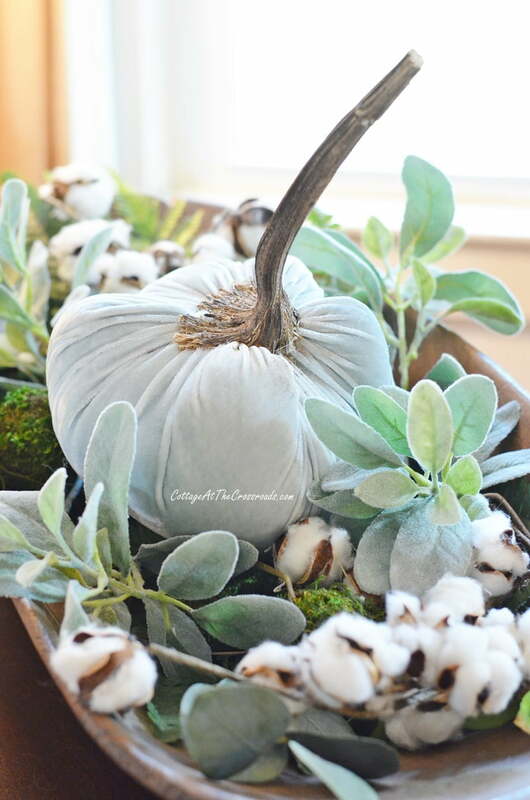 In this post, you’ll find some country cottage fall decor ideas using non-traditional autumn colors. 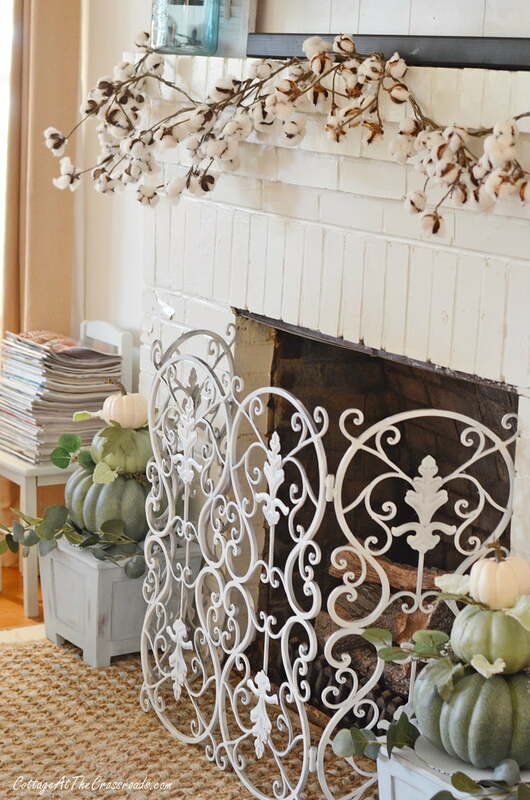 I’m just now getting around to showing you our fall decor around our country cottage. I’ve had it decorated for a while, but this has just been the busiest fall ever. So I thought I’d give you a little mini-tour today. I have slowly been incorporating more blue into our living area so I thought I’d show you how I decorated for fall without using any orange at all! Now don’t get me wrong. I absolutely love the vibrant colors of fall and used plenty of them on our fall front porch this year. But inside the house I restrained myself and went for a softer look. 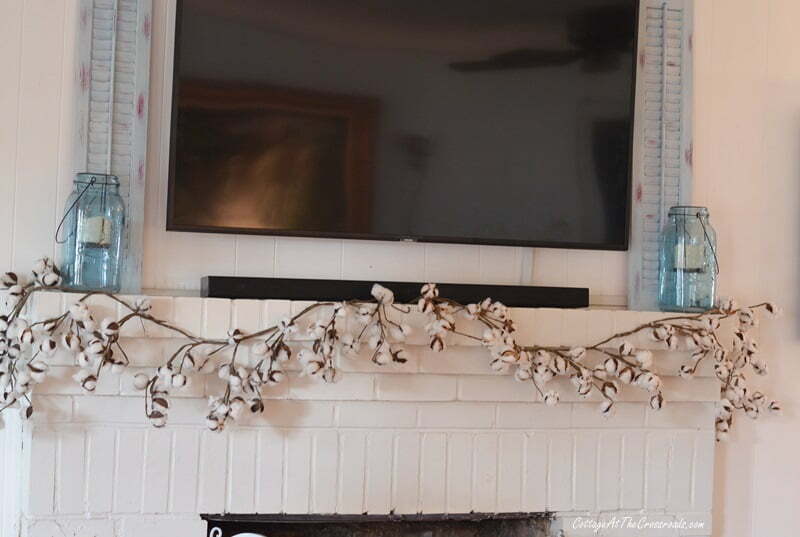 On our mantel, I used a simple cotton garland and kept the blue shutters and Mason jar candle holders on top. 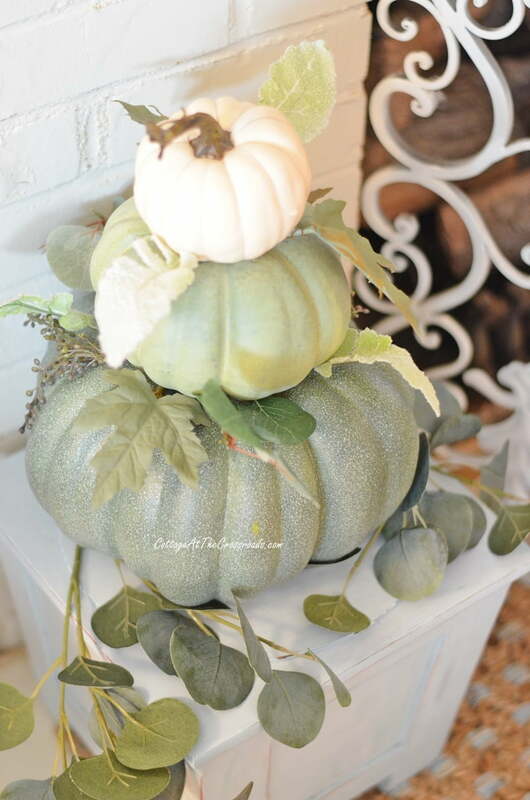 At the base, I placed 2 matching pumpkin topiaries on top of the wooden planters. I don’t think I’ve ever dressed the mantel this simply! I found these stacked pumpkin topiaries at Walmart in August. Luckily I grabbed them as soon as I saw them because they didn’t have any more the next time I looked. Their pretty shades of green and white blend perfectly with the blue planters. 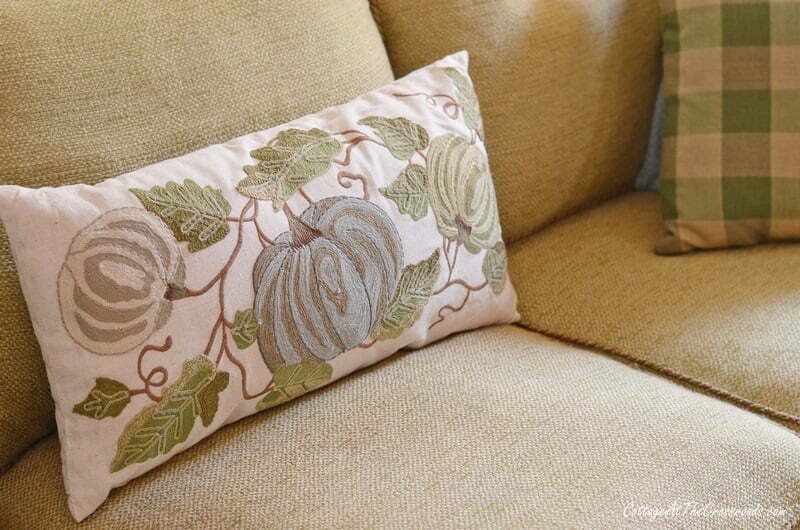 Not long after that, I ran across this pillow with a blue and cream colored pumpkins at Pier 1. It mixes well with our green sofa and the other blue and green pillows that I already had. 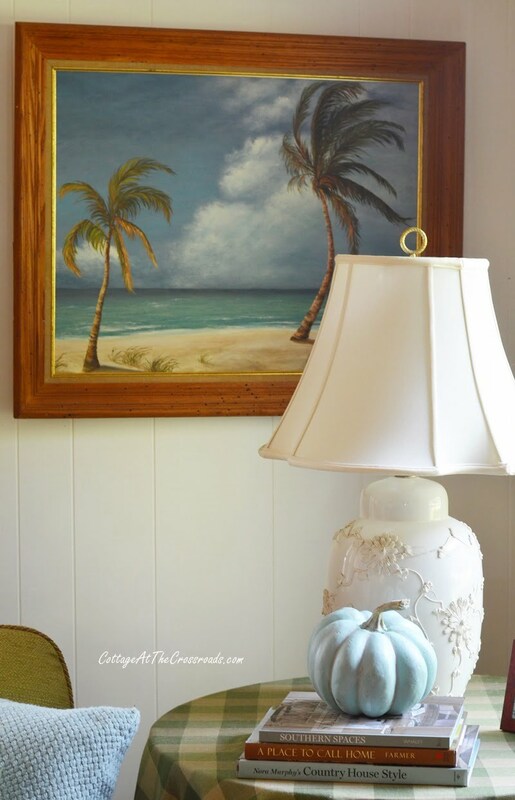 A simple blue painted faux pumpkin sits on a stack of book on the end table. On the coffee table is a little pumpkin decoration that I picked up from Target. 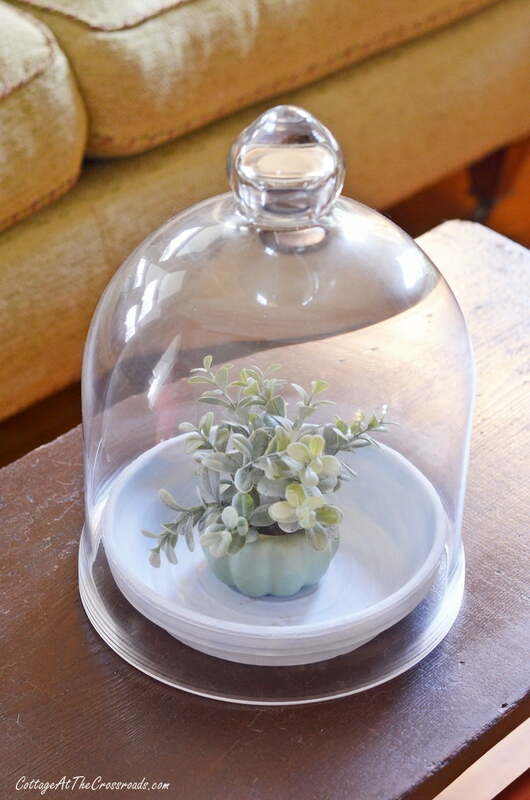 I just plopped it into a blue painted terracotta saucer and put it all under a cloche. How much easier can it get? Across the room on the sofa table is a blue velvet pumpkin tucked down inside my antique dough bowl. There’s a story about that dough bowl that I’ll save for another day but it is a treasure. I made the blue velvet pumpkin last year, and that’s when I discovered that dried sunflower heads made the best substitute stems for these handmade pumpkins. I wondered how long the stems would last, and I’m happy to say that it’s holding up fine. 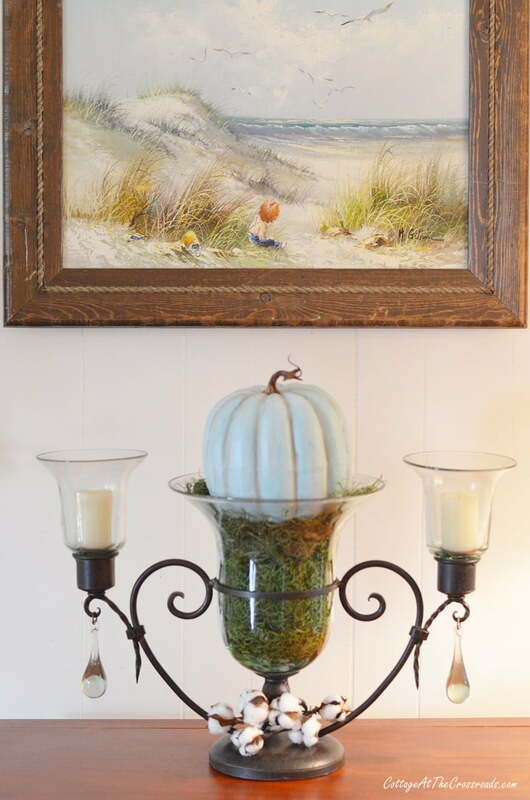 Underneath the seaside painting, I simply plopped another blue pumpkin into the glass floral container and wrapped a little cotton around its base. Over one of the dividers I gave the tobacco basket a blue fall treatment, and I placed a lamb’s ear candle ring around the candle. 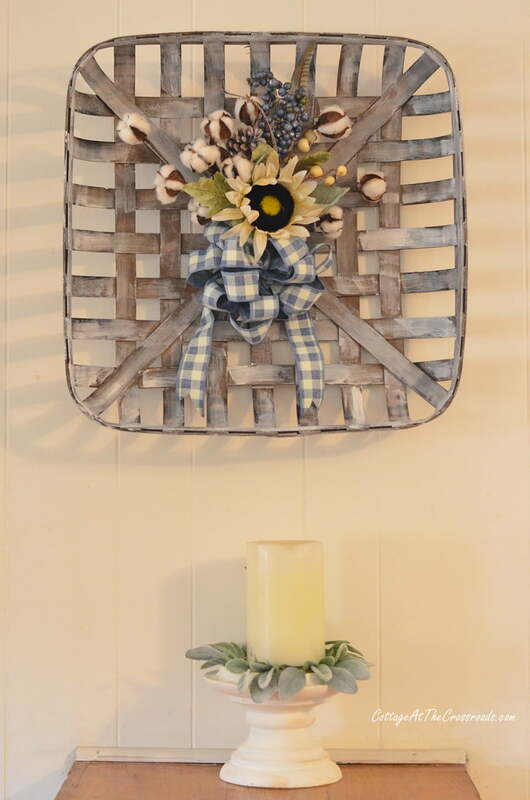 I hope you’ve enjoyed seeing our country cottage fall decor today. Soon I’ll be decorating for Christmas. Have you started yet? 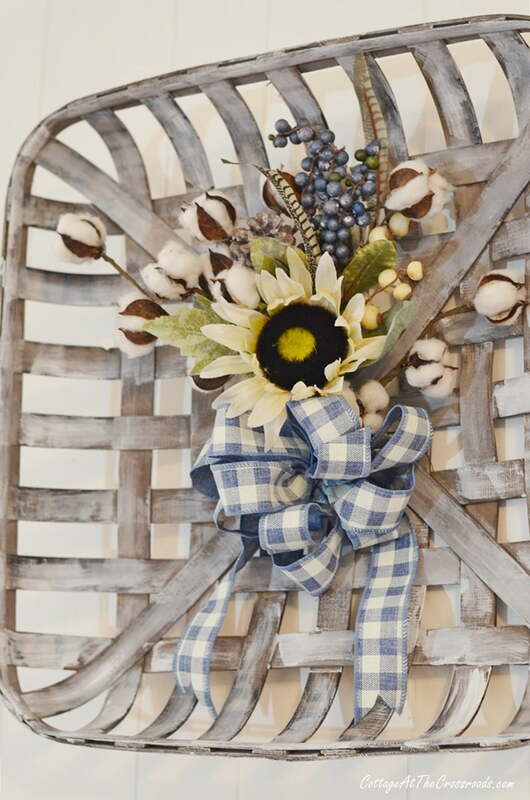 Love all your special fall decor, especially the tobacco basket! Happy Fall! Very pretty Jane, I love the cotton mantel swag! So pretty!! Love the simplicity! 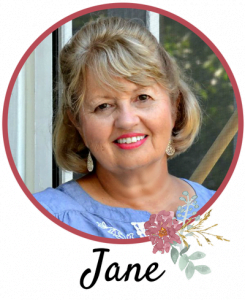 I love your style, Jane, and your love of colors that aren’t jarring. The tobacco basket caught my eye-I’ve always wanted one but I never actually knew how to decorate it. I just love everything in this post! I love the blue! It’s so soothing and pretty… Perfect!